Easter is only a few days away and instead of Easter egg shaped treats, I decided to make some fresh, spring inspired cupcakes! These are the perfect individual—no cutting or utensils needed—dessert. The fact that you don’t have to grease and flour cake pans and that they take less time baking in the oven has me making them more often. I mentioned before that I used to make party and wedding cakes and cupcakes for a time before getting my degree in graphic design. Cakes are what I’m familiar with and many times a go-to dessert for entertaining. Creating cakes and frostings that are gluten and refined sugar free (and still delicious) has been challenging to say the least. I’ve made many futile attempts with few successes, but I always share the wins and this is one of them! Since spring is now here, I wanted to make these very fresh in flavor. 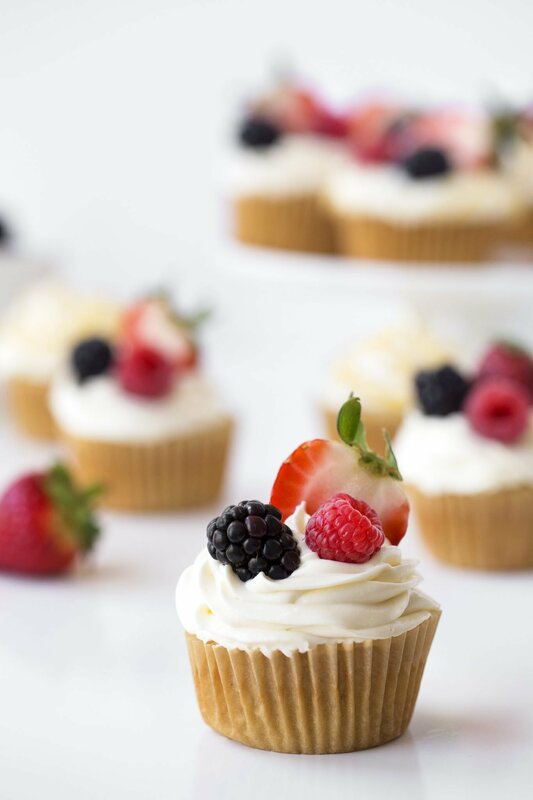 The cupcakes are adapted from my Summer Berry Cake with a bit of lemon zest added. I filled them with a chia jam made from fresh berries and chia seeds. For the frosting I blended together grass-fed butter, cream cheese, thick unfiltered honey, and some fresh lemon juice. It was the perfect fluffy topping and only mildly sweet. I love desserts, but I don’t like them overly sweet. Chia seeds absorb the juices from the berries and make a thick jam-like consistency. It doesn’t require any cooking or starch, just time to thicken. I cut a small plug of cake out of the center and ate them all filled each with the berry-chia jam—as much as would fit! I topped these with fresh berries and even drizzled lemon curd on a few. You can dress these however you wish—lemon zest, candied lemon peel or toasted coconut—just keep them in a cool place so the frosting doesn’t melt. I hope you enjoy these sweet treats! Do you have any special plans for the holiday? Since my husband is a pastor and will be working all throughout the weekend, we’ll attend a few services at our church with him. We’ll have our big Easter dinner on Monday when he’s off. Happy Easter to you and your family, dear friends! 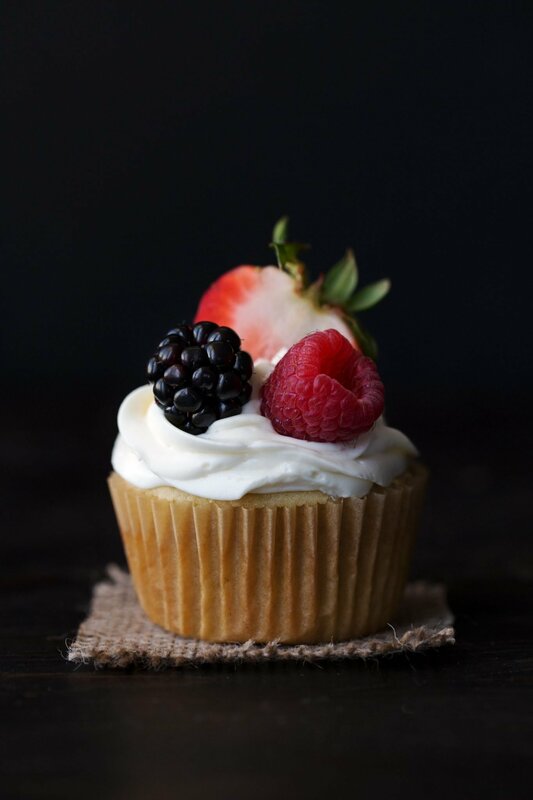 Delicious vanilla cupcakes with a hint of lemon filled with a fresh berry & chia seed jam and topped with a fluffy lemon cream frosting. Mash berries together with chia seeds and maple syrup with a fork or pastry blender until berries are pureed. Set aside for chia seeds to absorb the juices and thicken the filling. Preheat oven to 350ºF. Place cupcake liners into a 12 count muffin pan. Combine flour, baking powder, salt and lemon zest together in a large mixing bowl. Slowly blend in melted butter, maple syrup/honey, egg and egg yolk, milk and vanilla. Mix until batter is well blended and smooth. Scrape sides and bottom of the bowl and mix again. Fill each cupcake liner ⅔ full of batter. Makes between 10-12 cupcakes, depending on how much you fill each cup. Place pan into preheated oven and bake for 18-20 minutes, or until cake tops are domed and tops spring back when gently pressed. Cupcakes will not be brown, but you don't want to over bake them or they may be dry. Remove the pan from the oven and let cool slightly before removing the cupcakes. Take the butter and cream cheese out of the fridge 10-15 minutes before ready to use. Place into a large mixing bowl and beat until fluffy (If you have a whisk attachment, that works well.) Add half the honey, lemon juice/zest and continue to beat after until fluffy. This frosting will be mildly sweet. Taste and mix in more honey if needed. Continue to beat until frosting is light and fluffy. Refrigerate until needed. Into a small saucepan, whisk together egg, egg yolk, honey, lemon juice, and zest until well combined. Place over medium low heat and stir often until mixture begins to thicken, between 5-7 minutes. Careful to heat it slowly or the eggs can curdle. When it's finished, it should be thick and coat the back of a spoon. Remove from heat and stir in butter/coconut oil until blended. If mixture gets chunky bits from the eggs, make sure to strain it through a sieve before using. Chill in the fridge until ready to use. Place berry-chia jam into a plastic piping bag or sandwich baggie and cut a small tip or corner of the bag. Place the tip into the cupcake and pipe until it fills to the top. Do the same for the rest of the cupcakes. You can scoop a dollop of frosting onto each cupcake or pipe the frosting on. I used a large pastry bag and a Wilton 1M tip to pipe swirls onto each cupcake. If you plan on putting berries on top, don't put too much frosting or it will overflow. These cupcakes are picture perfect! I’m not surprised at all that you used to design cakes and cupcakes– you have such an eye for creating beautiful dishes and desserts. I recently made chocolate muffins that I filled with jam, but I LOVE the chia fruit filling SO MUCH MORE! What a fantastic idea, and way less sugar! The next time I make those muffins, I’m defiantly going to use this filling instead! Jocelyn these are GORGEOUS!! Loving the ingredients in them too… and I’ve never made gluten free cupcakes before so I’m definitely adding these to the list. Can’t wait to try!! OH. MY. GOSH. I am dying to have these droolicious cupcakes. And these pictures are so inviting. Hope you are having good holidays. I love these cute little cupcakes! I am pinning this recipe for later! These cupcakes look SO delicious!! Thanks for sharing this recipe. If I get a chance on Sunday I’m definitely going to try baking these. These sound & look so yummy! Can’t wait to try them – perfect for springtime baking!!!! These are so beautiful!! Haha I would have eaten the center of the cakes too- any food scraps and “waste” while I’m cooking usually ends up in the trash can… aka my mouth 🙂 These are so gorgeous! I love the idea of honey in the lemon cream frosting– does it not separate from the cream cheese? I’ve always noticed that whenever I eat a piece of toast with cream cheese and drizzle honey on it, it cracks the cream cheese oddly enough. But one of my favorite flavor combos! These are lovely and look delicious! I love the option of the lemon curd drizzle. Doesn’t lemon curd make everything better? Gorgeous photos as well. Lauren, thank you for taking the time to leave such a positive comment. Comments like yours really encourage me. I hope you find other recipes on the blog that you enjoy as well. Please let me know if there’s anything I can help you find. Your photos are stunning! These look so delicious, too. Love the post! Thank you for your encouragement, Sara! My family ate these all up. I am glad you enjoyed the post! These look delicious 🙂 Happy Easter! I’m spending the weekend with my fiance’s family. It’s been relaxing so far – we’re taking charge of dinner tonight so hopefully that goes well, haha. Have a lovely weekend! Isabel, happy Easter to you as well! I am glad you have had a relaxing weekend so far. Those are always great! I can relate, it’s been somewhat relaxing for me as well. Best of luck on your dinner. It will be great! Have a wonderful weekend, friend. These look beautiful and sound delicious! Perfect way to welcome spring! Thank you, Carrie. I love spring and these colors make for a great spring-themed recipe. I hope you have a great weekend! These look picture perfect for an afternoon tea! I agree, Sophie. These would go great with some tea time! These sound incredible! ALLLL the heart eyes! Thanks, Christine 🙂 I appreciate the encouragement! Thank you for your support by pinning this recipe, Dahn! Thank you, Dahn, we are blessed. I love when we can celebrate together something so dear to us. I hope you have a wonderful weekend! Man, all these flavors! I can’t wait to try this out! Raj, the combination of flavors really came out great. I hope you get a chance to try it! These sound so yummy and look just as good! I don’t think I’ve ever had lemon cream frosting, I love lemon though so I should try it. Samantha, the lemon flavor put a great twist on this frosting. It’s really delicious! WOW! Cupcakes looks so beautiful and delicious. Loved the recipe. Bookmarked! Thanks, Kushi, for bookmarking the recipe! I love simple but delicious desserts!